If you love animals as much as we do, you will LOVE What's New At The Zoo? 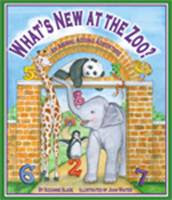 : An Animal Adding Adventure by Suzanne Slade. My son had so much fun with the math concepts, he did not want to go to bed until the book was complete!! Click here for the ebook version. My full review is coming soon! Wow - I love these giveaway. Great books for my boys! My email address is laarlt78 at hotmail dot com and I am a follower. Count me in on this one too! I've got all three of you down twice each!! BTW, this one is my son's favorite of the four so far!!! Reviews coming this week!! Wanda & Katie . . . got you here too!! This book looks so cute! My sons would love it!